Inspiration to travel can come from several sources, be it expected or not. My latest journey was inspired by one of the strongest sources of them all- escaping from the scorching summer sun. I wanted to go to a place which was cool enough to chill me to the bone but not enough to not be accessible by road. After a tiring yet satisfying research of the exhaustive list of options, Manali came out to be on the top and that's where I headed to on the next bus from Delhi. 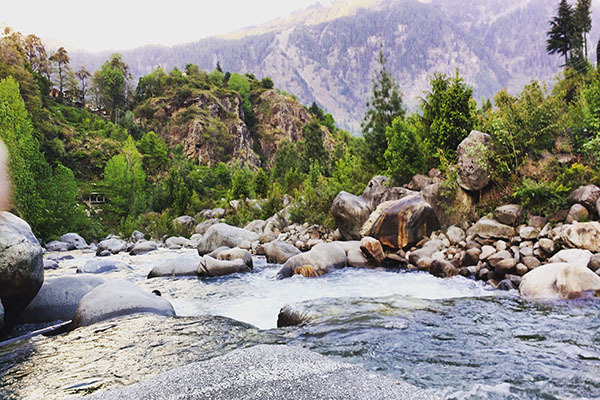 Manali has been blessed with a near perfect location in the Kullu valley with three different mountains surrounding it and the Beas river flowing through it only manages to add to its appeal. After a bit tiring 14 hour bus journey, I reached the town just before mid day. There was a stark contrast in the temperatures of the destination and the place of my departure and that was something I had been longing for all the way here. I headed straight to Old Manali, the part of the town famous for housing backpackers. I must admit the two parts of the town are poles apart, coexisting by each other's side, bound by the common thread of natural beauty. Although the central town of Manali is quite attractive, it is a bit spoiled by the mainstream tourism. Plagued with countless hotels trying to attract potential customers and the shops built specially for the purpose of tourism, it is not altogether what a traveler desires. As you enter Old Manali, you cross an invisible barrier separating the two worlds. The air smells different, it being laidback in itself. You feel you belong there with a backpack and suddenly, the mountains seem much closer to you. This magical transformation, combined with the attractions such as Manu and Hidimba temple, make Old Manali the place to be. My accommodation was located near a parking lot, being conveniently close to it and strategically away from the main street. Although the view of the mountains covered in snow visible from my room was tempting enough to look at all day, I set out to visit Manu temple which was almost behind the place I chose to stay at. As is evident from the name, the temple is dedicated to sage Manu, who according to Hindu mythology was the creator of the universe. 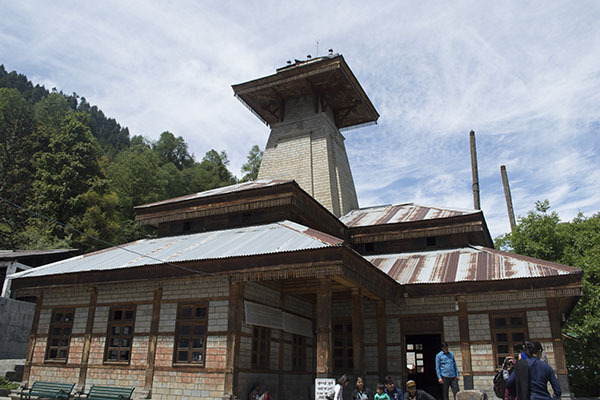 Since it is the only such temple in the world, people who visit Manali make it a point to come here at least once. It is also famous for the its location because of which one gets breathtaking views of the valley. After admiring Manu temple, I headed to another famous and unique temple of Manali, Hadimba temple. Named after Hadimba, the demon Goddess in the epic Mahabhrata, it is located about 3 km from Manu temple. After the Hadimba temple, I started my search for a place to have some food after this long and tiring day. I didn’t want to go too far from the place of my stay today. On the edge of the main road, just before the narrow lanes leading to my hostel started, there was a tiny café called Bean and Gone. The owner, Mr. Henry, is quite friendly and believes in having a chat with almost everyone who visits his café. He made me a special Hazelnut coffee when I told him it was my first visit to the town. He had lived all his life in Manali and knew the city by heart. We discussed at length about life amongst the mountains, which he had been living and I longed to live, and at the end of an hour long discussion, he offered me chocolate fudge for free! He also told me about a trek to a waterfall- Jogni falls and I made up my mind to go for it the next day. 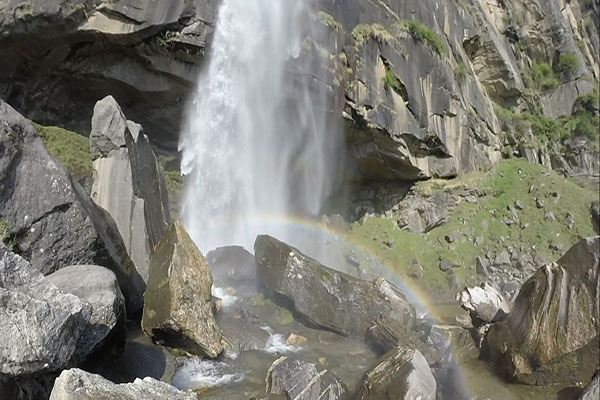 The trek to Jogni Falls starts from the village Vashishth, near Old Manali. The trek usually takes half-an-hour to an hour to complete depending upon one’s speed. Although it isn’t difficult, there are places where I found it difficult, me being a lousy trekker, especially when the path was too narrow and the drop too steep. But in the end, it was all worth it. Jogni falls isn’t the type you see in pictures and which has a clear white stream falling down. The flow of water isn’t too much but the beautiful scenery all around more than makes up for it. The 200 feet high fall is a delight to watch. The rocks through which the fall flows aren’t embedded in the mountain. They seemed to have been arranged randomly and it seems the structure might come crashing down anytime. This is what makes it somewhat more attractive. I had been in Manali for more than one-and-a-half day but I still hadn’t visited the banks of Beas. Almost feeling guilty, I came back from Jogni falls and headed straight to a small trek to a bank which, as per the locals, was a peaceful one since not many people knew about it. The way to the river was through a not-so-dense forest. I guess this is why no one preferred to come to that particular place close to the river. Although light travels faster than sound, the swooshing sound of the running river preceded its sight as I approached it through the forest. I was almost tired and was thinking of taking some rest when I heard it. With a new-found energy, I rushed towards to get the first sight of the river. I sat on a slippery rock; my shoes on another. I dipped my feet in the cold water as the river flew, oblivious of my presence. The water was unbearable for a couple of minutes but after that, its soothing factor was back. Staring all around me, one by one in every direction, all I could find was tranquility. The sun had hidden behind a thick cover of clouds and was unlikely to come out for the rest of the day. The clouds, as if conquerors of a foreign territory, roamed boisterously close to the surface all around me. It was the perfect time for introspection and that is exactly what I did for the rest of the time I sat there. After the soul-refreshing moments at the river, I headed back and straight to Drifter’s café, which had been recommended to me by lots of travelers as well as locals. The café is located on the road to Manu temple on the main street. It has an indoor seating as well as a rooftop one. The first thing I was served with was a wide-variety menu from which it was difficult to zero in on a dish. I asked for their specialties and was served a Minced mutton Lasagna and Chicken breast stuffed with cheese and spinach. The food was delectable to say the least and worth every penny they charged. With this, my journey had almost come to an end. It always makes me sad when it is time to go back and to leave such lovely places behind. But I console myself by my belief that our appreciation of such beauty is higher when we get to experience it for some time and as a break from the mundane lives we lead. That’s why I want to live my life with these constant breaks and to travel more than humanly possible.